Camouflaged pink robot and redneck assault rifle army saves day against tennis ball plot. Inside, Donald Trump screamed at America, trying his best to scare everyone into voting for a guy who has no experience in government, but makes big money in his specialty, building bankruptcies. “I know how to game the system, been doing it for forty years. So, believe me, I’m the best guy to rig it from the inside for us billionaires. But you poors will love it, trust me!” he shouted, as if to unruly school children. Crazed plotter threatens to serve dangerous tennis ball: But brave assault rifle patriots hold ground until police in riot gear arrive. Outside, a threat was building that nearly brought down the entire convention: tennis balls. Not even a hundred assault rifle-wielding redneck patriots could stop them, distracted as they were by trying to look important and menacing. So, a squadron of riot police moved in, backed up by federal SWAT teams. Carefully, so as not to set off the terrifying phalanx of Code Pink women, a dozen strong, the police confiscated their frightening weapons: pink tennis balls. 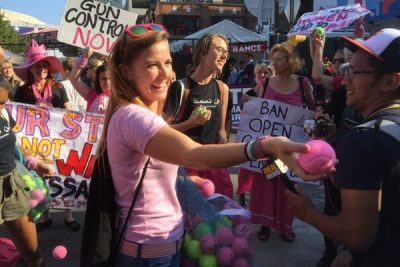 What caused these pink-clad plotters to ignore the law, which clearly stated that these dangerous tennis balls were not allowed anywhere near the site of the convention (but assault rifles were a-ok), is not known. But police believed they had contained the threat, and began arresting these un-American tennis enthusiasts. Cleveland’s finest police officers swung into action. They knew exactly what to do, taking a page from Dallas police. They brought out “Blasty” the robot, camouflaged in pink to blend in, with a bomb attached to its spiny little fingers. Luckily, the tactic saved the day. The little pink grannie put the little pink tennis ball down, and was taken into custody and tortured, as per The Donald’s wishes. America was safe again!